I paired the pink moto jacket with this lace-up ruffle cami. 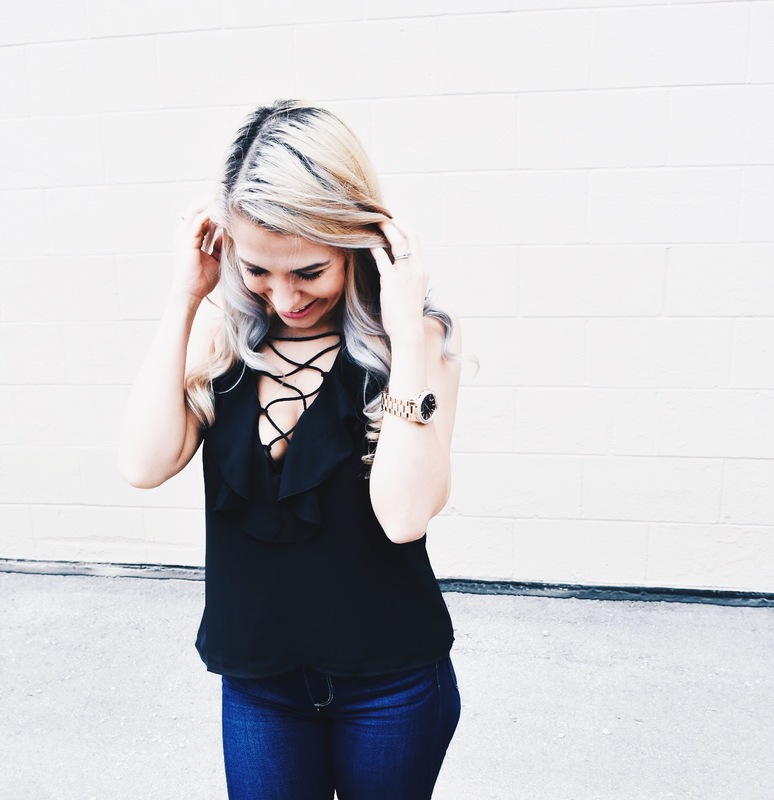 You’ve seen the cami before in my Nordstrom Anniversary Sale 2018 try-on session in another color, and I love how flattering it is. It doesn’t flare out at the side like a lot of other camisoles, so it doesn’t make my hips look any larger than they actually are. This pink moto jacket outfit features the Halogen Boiled Wool Blend Moto Jacket. It’s available in regular or petite, which, as a short girl, I always appreciate. Here’s what this pink moto jacket looks like all zipped up. Personally, I think an open jacket is generally more flattering, but I wanted to show you all both looks. In the early fall, my favorite way to wear a pink moto jacket [or any jacket, really!] is draped over my shoulders. It’s an effortlessly chic look. By the way, if you follow me on Instagram, you know the behind-the-scenes of these waist-crop shots. Just know that 99 times out of 100, the reason I crop at my waist is because there was a 3-year-old running by my legs. Shooting with kids is always an adventure… well, basically doing anything with kids is an adventure. For this pink moto jacket outfit, I opted to do my makeup with the MAC Nordy Girl palette and the Little MAC Lip Duo in Pink, both of which are part of the Nordstrom Anniversary Sale 2018. I have the metallic palette [although there’s also a matte option], and I love using the shimmery shadows to add some glam to my looks. 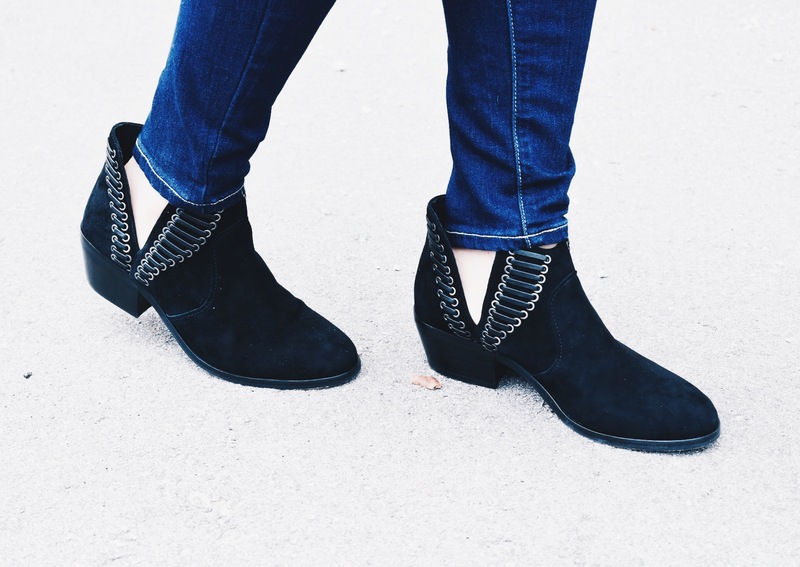 How fabulous are these booties? I’ve never had a pair with the side cut out like this, and I really love this detail. This is the Vince Camuto Pevista Bootie, and it’s priced at under $100 during the Nordstrom Anniversary Sale 2018 [which ends on August 5th]. The booties are available in 3 different colors and currently stocked in several sizes. 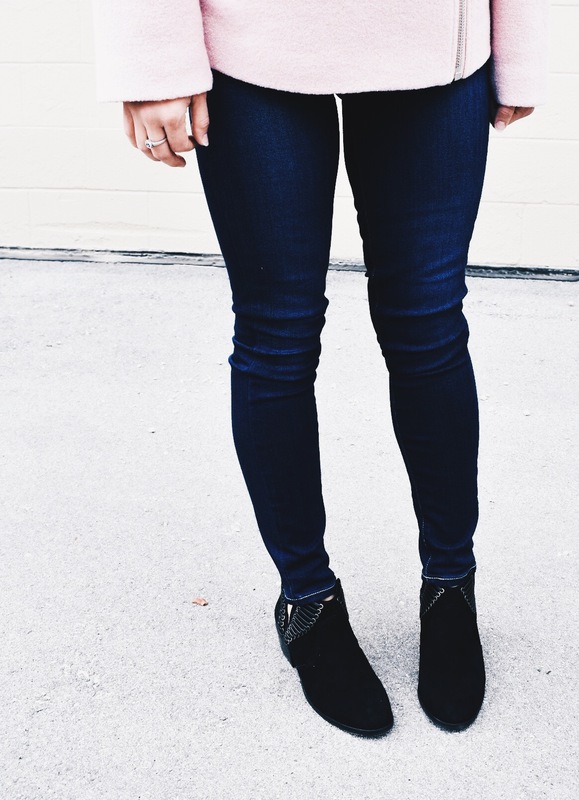 These jeans are one of my favorite NSALE purchases… honestly, they’re one of my favorite purchases I’ve ever made. 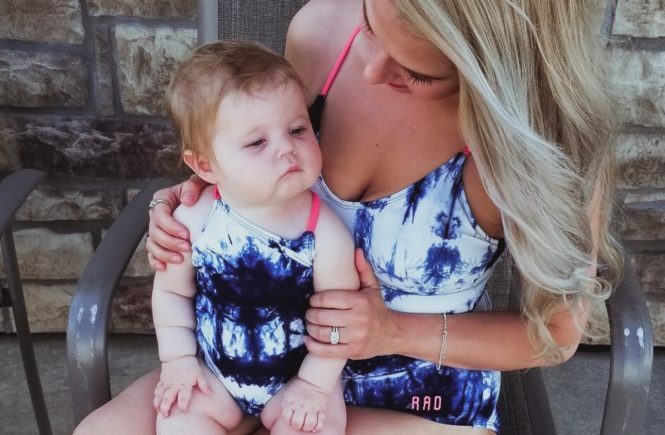 You’ve seen them in a few outfits before [here, here, and in my try-on too! ], and I just can’t stop wearing them! They’re a bit of a splurge for me, even at the NSALE price–but the fact that they’re super comfortable and didn’t need to be hemmed won me over. Like I said, this pink moto jacket outfit is one of my favorite looks I’ve ever styled. It’s crazy how a simple jacket can make you feel so glamorous! 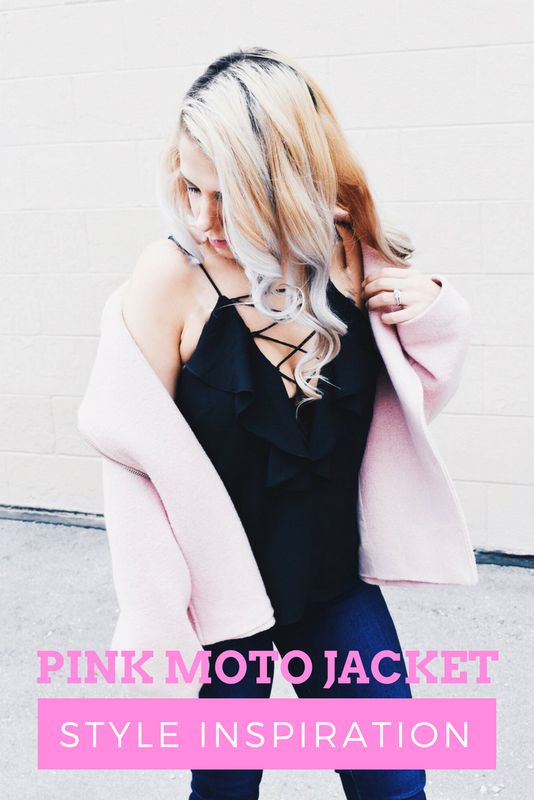 If you’re wondering what to wear with a pink moto jacket, I hope this post was helpful. Pin this Pink Moto Jacket Outfit for later! I’ve teamed up with some fabulous bloggers for a Millennial Pink Style Challenge! 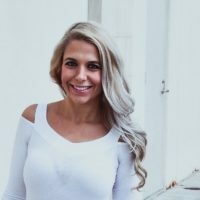 Some of us styled outfits and others chose to do home decor, so take a look at the other blogs to see everyone’s take on this fun trend. LOVE this moto jacket! I got a leather one in the NSALE from Ted Baker the same shade and I’m in love with it! Thank you for the outfit inspo! I bet the leather one is just gorgeous! I grabbed a different leather moto jacket on the sale so decided to opt for the wool in this shade. 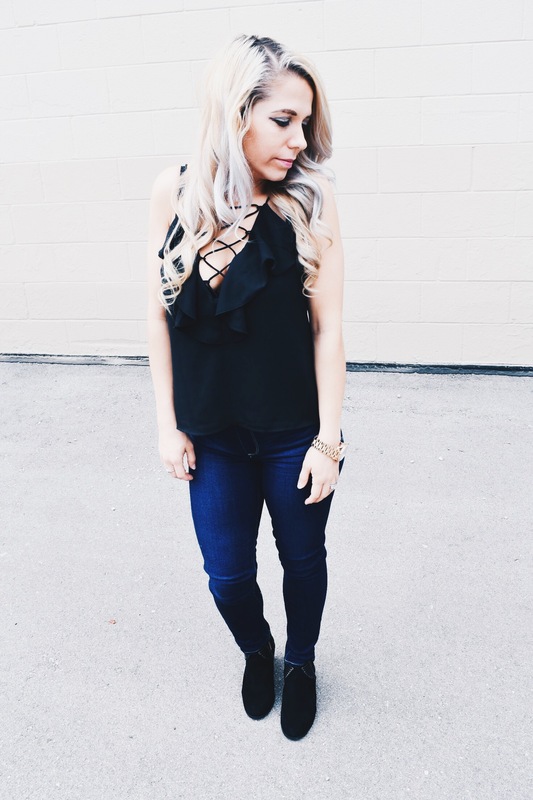 So many good NSALE outfit options this year! This jacket is adorable! How did I miss it in the sale?!?! I feel like I find something new every time I look at the sale! Good for my closet, not so much for my wallet. Ha! Thanks for stopping by, Jenn! Girl – I agree that a jacket can make you feel super glam or chic! And you scored with this jacekt from the #NSale! I didnt even see this one. How did I miss it? And did you see what I did with millennial pink as a decorating idea? There are so many good picks on this year’s NSALE, it’s easy to miss some of them! I actually only found this jacket while specifically searching for millennial pink ideas. And yes, I loved your home decor ideas. Super cute! Thanks for stopping by! Hi. I am Ada. Glad I found your blog. Love your style! 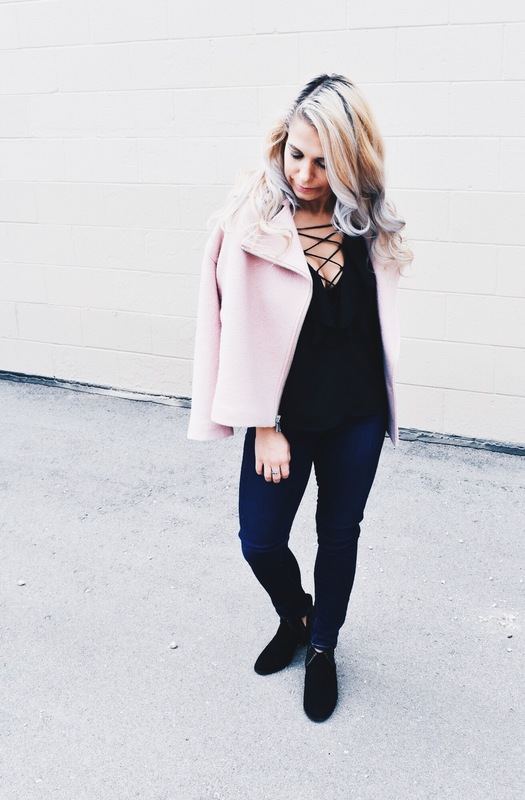 That laceup camisole is so cool and I love the pink coat!